Long before Pumpkin Spice Lattes and pumpkin everything, I have awaited fall the very day it ended. It's my season, and it has been since I was a little girl. I could always smell fall before it came. I remember asking my mom when I was very little, "How come I can smell fall coming? I can't smell any other season." I remember her saying, "Probably because it's you're favorite season. People can smell their favorite season." Whether or not she meant it or was making it up, I don't know (if Mama doesn't know the answer to a question asked, she often makes something up and is known to be right on more than one occasion). But I do know, fall is the only season I can smell, and it happens to be my favorite. Make the sauce. Over high heat, combine sugar and water in a large saucepan. Stir once and let sit until it starts to bubble and turn light brown color (do not stir when it boils). Use a candy thermometer, and when the sauce gets to 230-250 degrees, turn the heat down to medium. Let the sauce sit until it's amber in color. Remove from heat and add the heavy cream (stand back when you do this, the sauce will come to an extreme bubble). Add the liquor, pumpkin spice, and salt. Stir to combine. As it sits off the heat, the sauce will harden. To keep it smooth and warm, simmer. Heat a pan with a splash of olive oil to the highest heat (like you're going to boil something) until the oil smokes. Prepare salmon by brushing on about 1 tsp of olive oil and sprinkling 1/2 tsp salt and 1/4 tsp pepper on each filet. 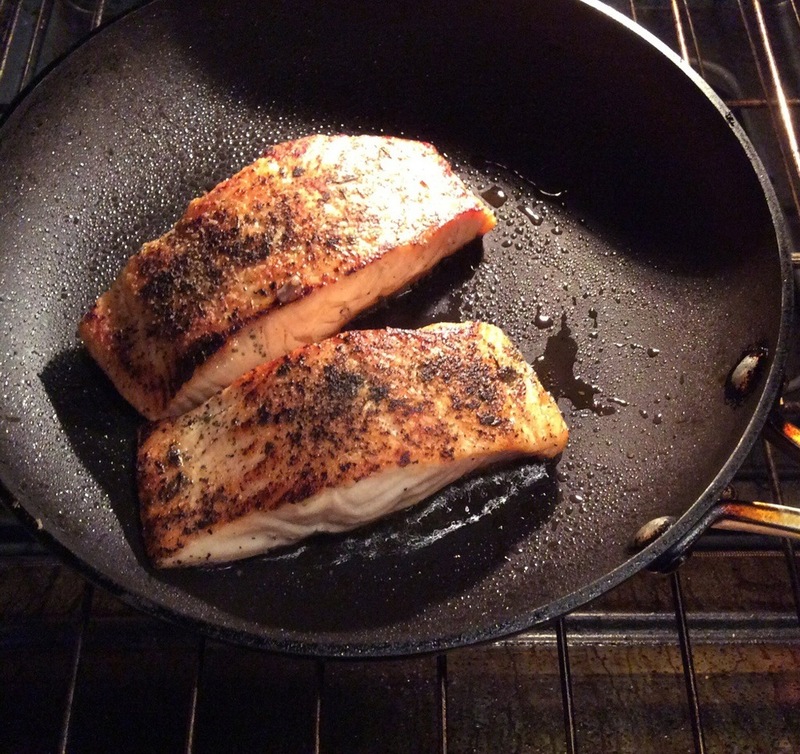 When oil is smoking, put salmon face down in the pan and don't move for 2-3 minutes (this creates a perfect crust). Flip salmon and let cook on the stovetop for 1 more minute. Put pan in the oven for 3-4 minutes (If you don't have an oven safe pan, transfer salmon to a baking sheet). Plate the salmon. Put one filet down on each plate and top with caramel sauce and chopped pecans. Serve with mashed sweet potatoes or roasted pumpkin!